Do you want to drive more targeted traffic to your website from search engines? To drive more organic traffic, you’ll need to analyze your SEO reports and optimize your website for search engines. In this article, we’ll show you 4 easy ways to boost your SEO rankings with Google Analytics. Do you want to find out information about the age, gender, and interests of your website visitors? Collecting demographics and interests data allows you to know more about your visitors, so you can deliver content or create products addressing their needs. Drilling into the demographics and interests report lets you identify who your high-value customers are. For example, if you own an eCommerce shop, you might want to identify the type of customer with the highest eCommerce conversion rate or revenue. If you’re a publisher, you might want to identify the type of visitor who has the highest engagement. Once you’ve identified your high-value user group, you can target that group for marketing and remarketing campaigns to get more conversions and ROI (return on investment). The best way to view your WordPress site’s demographics and interests data is by using MonsterInsights. It’s the most popular Google Analytics plugin for WordPress. MonsterInsights helps you to add Google Analytics to your WordPress site easily and allows you to see all of your most important website data right in your WordPress dashboard, without having to navigate away from your site. The first thing you’ll need to do is install Google Analytics on your site with MonsterInsights. 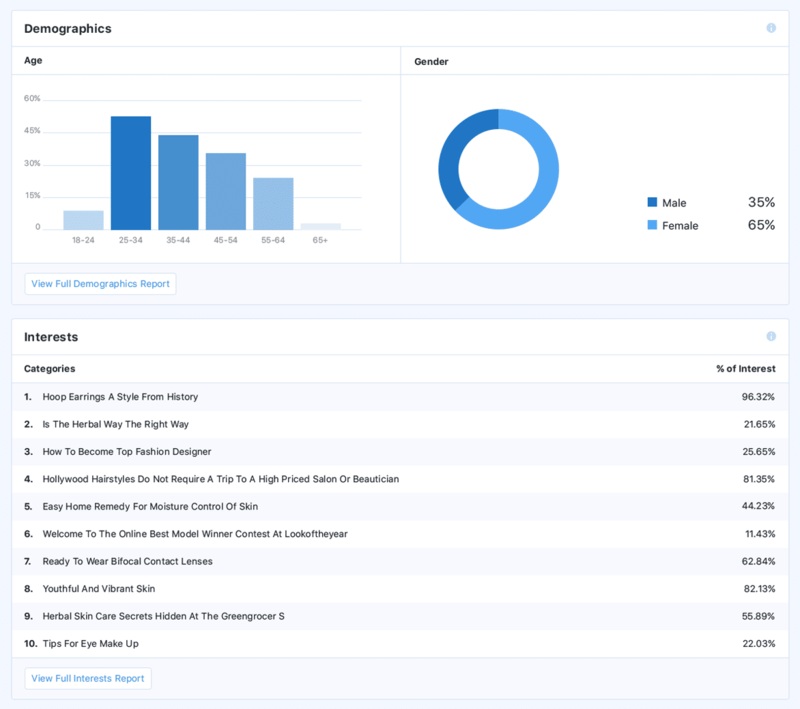 After that, you’ll need to enable tracking demographics and interests reports from its settings. Once you’ve done that, you can view your site’s demographics and interests data by going to Insights » Reports » Publishers from your WordPress admin dashboard. If you want to view these reports on Google Analytics’ platform, you can click on the ‘View Full Reports’ button at the bottom of each report. 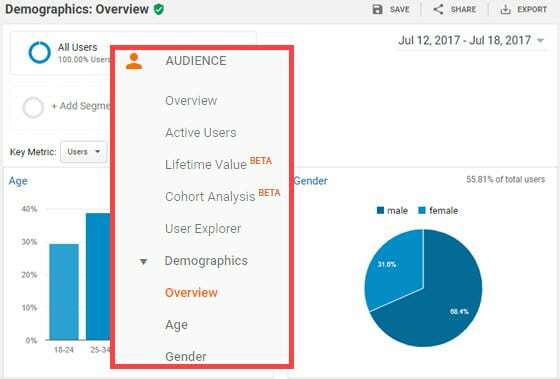 Or, you can sign into your Google Analytics account and navigate to Audience » Demographics » Overview. To get an overview of the interests data, you can visit Audience » Interests » Overview. 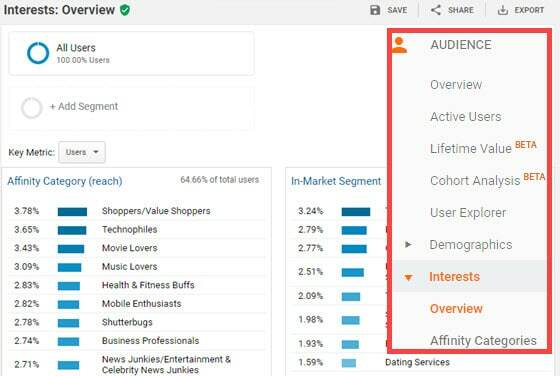 You can also find specific interests reports on affinity categories, in-marketing segments, and other categories within Google Analytics. Google AMP offers a super fast browsing experience for your mobile visitors arriving at your site from Google. Studies show that 90% of publishers who enabled AMP are seeing higher click-through rates and 80% of publishers are getting more views. 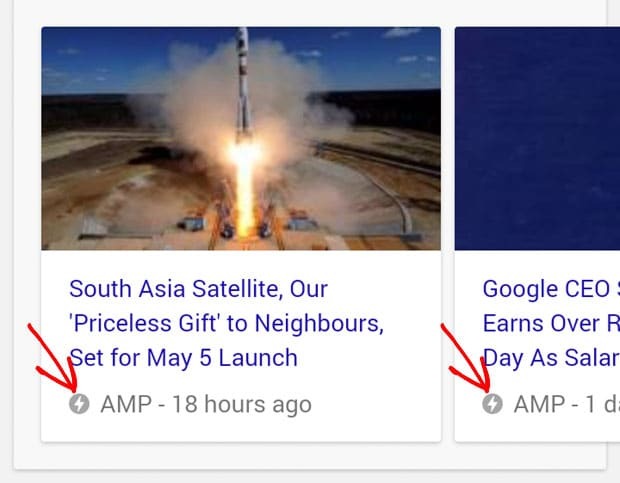 If you’re a publisher who wants to drive more organic traffic to your site, you might want to add Google AMP to your website. To analyze the user interactions on your AMP pages, you’ll need to add Google Analytics tracking. Setting up Google Analytics tracking on your Google AMP pages can be tricky because you’d have to modify the Google Analytics tracking code manually, and sometimes it needs some troubleshooting to get it to work right. 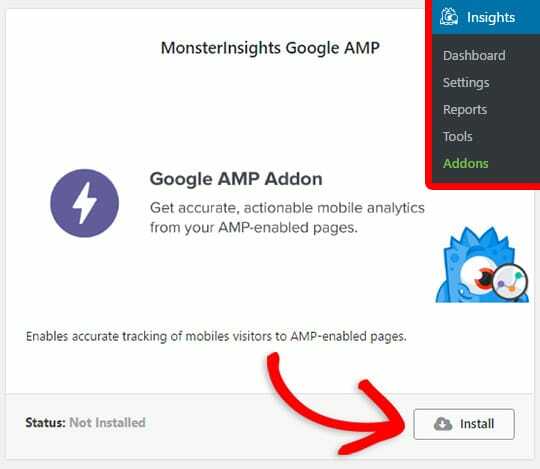 Fortunately, with the MonsterInsights AMP addon, you can easily enable Google Analytics tracking on your AMP pages with just a few clicks of your mouse, no coding skills required. If you need help, read our guide on how to add Google Analytics to AMP pages. After the setup, you can find the AMP data by going to Behavior » Site Content » All Pages in your Google Analytics account. Type /amp in the search bar above the table to find the traffic reports for your AMP pages only. Google Search Console is a free service that allows you to monitor and maintain your site’s presence in Google search results. You can connect your Google Analytics account with Google Search Console, so you no longer need to export your search console data to a spreadsheet file to conduct further analysis. For detailed instructions, here’s our step-by-step guide on how to configure your WordPress site with Google Search Console. Once the setup process is complete, you can view your website’s top-ranking organic keywords by visiting Insights » Reports » Search Console. If you want to see this report in your Google Analytics account, you can click the ‘View Full Queries Report’ at the bottom of the report. Or, you can open the Google Analytics site on your browser, log into your account, and go to Acquisition » Search Console » Queries. This data gives you insights into how users search to find your pages and the relevancy of your pages to those queries. In this report, you can find useful metrics like clicks, impressions, CTR, and average position. A referral is a website which links to your site. In other words, it’s a website that you’re getting backlinks from and receiving traffic through those links. If you don’t know what backlinks are, they’re your site’s URLs that other websites use on their sites to point their users to your site for specific content or products. Backlinks are one of the top search engine ranking factors. More backlinks from high authority sites can help boost your site’s position in search results dramatically. 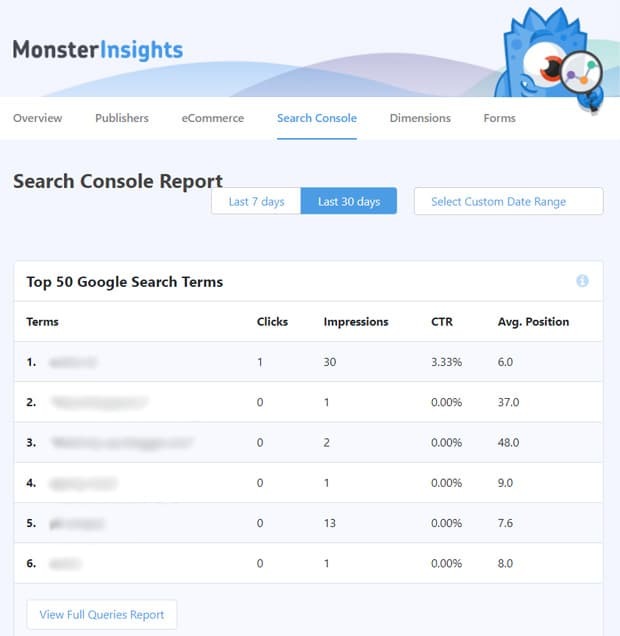 With MonsterInsights, it’s easy to find your top 10 referrals. Just navigate to Insights » Reports from your WordPress dashboard. 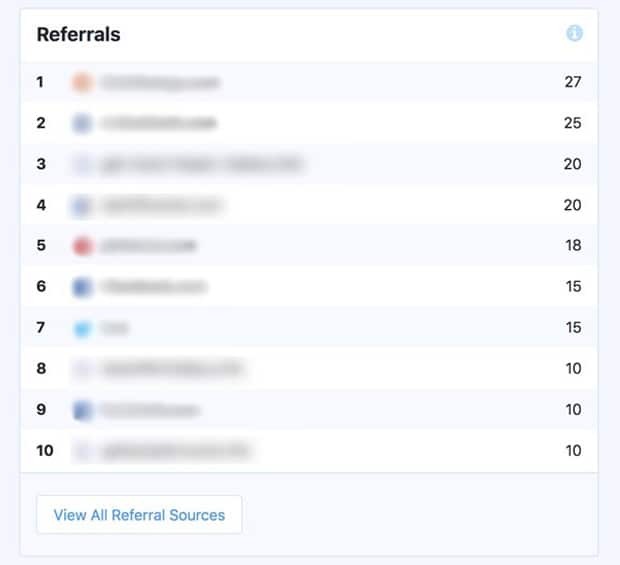 Then, you’ll see your referral sources listed in the Overview report. Now you can analyze what type of websites are referring to your site and try to get more backlinks from other, similar, sites. You can also contact the referral websites and offer some cross-promotion plans which can benefit both of your sites. If you want to see a more comprehensive list, you can click the View All Referral Sources button at the end of the report table. Doing so will redirect you to your Referrals report on your Google Analytics account. 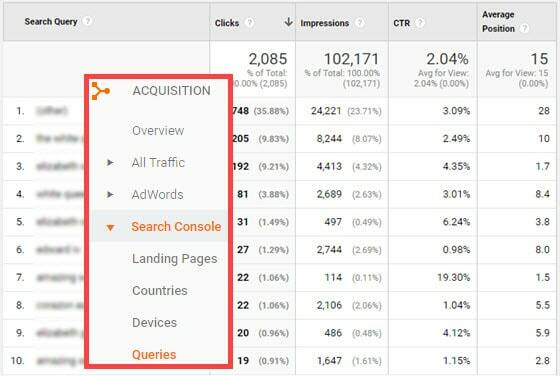 Tracking your SEO results in Google Analytics provides you insight into how to optimize your content to boost your SEO rankings. If you enjoyed this article, you might also want to read our guide on custom dimensions in Google Analytics.